Let's run down the origins of the parts we solder to a board. We discover that "Made In ____" is a lot more mixed than we expected. We build a heck of a lot of stuff here in Boulder. In fact, next week we estimate we will produce our 1,000,000 widget! That's a lot of assembly, testing, and design work going on right here in Colorado. But I'm often surprised by just how big the supply chain is to be able to put together some of these widgets. What is really Made in the USA is actually Made in Earth. We depend on eachother's countries to produce the best of what we're known for. Why did this come up? We're getting more and more requirements to mark the products we sell with a 'country of origin' certificate. This is needed when our customers or distributors try to import our products into their perspective countries. Customs agents in Brazil need to know whether the product came from the USA, or from Ireland, or from Mars. We started asking ourselves - where do our products come from? If we build stuff here in Boulder, is that the country of origin? What about the COO (country of origin) of parts we solder to a board? 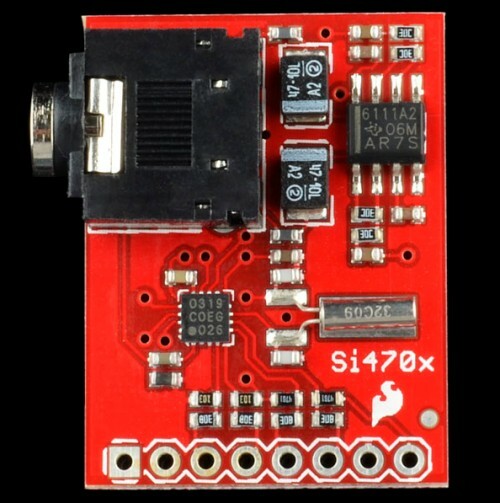 The Si4703 FM Receiver breakout board is relatively small and simple, but it has a whole host of parts on it - 31 in fact. Researching these parts online looking for COO can be very difficult. It's easier to walk over to the production floor and take a look at the reels and bags of components. Almost all are clearly marked with a country of origin. I was surprised by the wide mix of origins. Resistors for this build can come from Thailand, Taiwan, Israel, or China. Capacitors may come from Taiwan, USA, Israel, or China. Japan seems to have cornered the market of magnetics. The ICs come from Singapore and Mexico. Did you know the TPA6111A2 has 0.0794mg of gold in it? That's like $0.003957! Officially, we are completing what's called a transformational process on this breakout board. We significantly change the raw materials to the point that we have created something new. We can now claim that SparkFun USA is the country of origin for this product. Alternatively, if we imported orange juice from Mexico then added water and called it Horange Juice, the country of origin would still be Mexico. My point here is claiming that "Made in _____" is good/bad is largely misleading and often politically motivated (read up on trade tariffs). We want you to know that the parts and products you buy from SparkFun are Made in Earth. It's time for a big world hug. Since the important mineral were formed in our Supernova; can we not go one better and claim Galactic Origin? ... and powered by funk. Interesting, this seem to hit a few nerves with some. For me, CoO, RoHS, ISO, WEEE, CFR, ESD, etc are daily terms for me since I work at an Electronics Contract Manufacturer. There is a bit of black magic to all of the standards, regulations, and legalities involved with all things electronic. However, with the right information and resources, all of these speed bumps can be overcome. As far as "Made in USA", there are many other formats being used to get around the restrictions yet still give the end user the "Made in USA" comfort feeling in the quality of the product. The most common I am seeing is "Assembled in USA". Most end users it interpret that as "Made In USA" and it is easier for that to be a legally true statement. "A product that includes foreign components may be called "Assembled in USA" without qualification when its principal assembly takes place in the U.S. and the assembly is substantial" See: http://business.ftc.gov/documents/bus03-complying-made-usa-standard#Assembled%20in%20U.S.A. After reading "Made in Earth", I had to smile. The world is a complicated place, full of complicated concepts - many of which have been contaminated with political agendas. I would like to simply say that I am so happy to have found a company that has such a tangible connection with its customers. In this hectic day and age, it isn't often that one can say that they feel the company they are doing business with is really looking out for everyone's best interests. I feel sparkfun is. So, what this should tell us is that in reality "Country of Origin" means nothing, it is just a bunch of political BS. The components I bought this year came (to me in Canada) from Canada, the States, Mexico, Israel, Myanmar, Malaysia, Japan, China, Taiwan, the UK, France, and India. The cost of this "big world hug" is all the fuel spent transporting the stuff. Of course, it's a bit difficult to get only components made in North America, nevermind just Canada. As I understand it, it's where the last change in the harmonized tariff code that classifies the item takes place. If you have a 40-pin header from China and you cut it into 2 20-pin headers in the USA, you haven't changed the TYPE of thing it is. It's still a header, so the COO is China. If you have bodies and pins made in China and you combine them into a finished connector in the USA, the harmonized tariff code has changed and the COO is USA. At least that's how it works at the company I'm working with. I live in Brazil... and it's really expensive to buy electronics, cars, etc. Anything from outside the country has a %60 tax. Which sux a lot given the fact that Brazil does not make this things you buy from outside. It's not like you buying from outside because you want to, or because it's better... but because there is no such thing made in Brazil. An ipad (ipad 1, with wifi and 16 GB = $500 in US) here is like $790. Brazil just makes it difficult to buy things from outside, with no reason. you're right up there with my favorite band haha. It is even more complex than simply looking at the COO of each component. Each component is also made of a variety of parts with varying origins. ie: that RES-07857 is listed as Israel or China, but the components such as leads, actual resistive element and the package might all come from different COO then assembled in yet another. Very few things have an easily identifiable COO, and even then it is a challenge: The tomato from your backyard might have been fertilized with chemicals from various sources etc. I would hope we can all agree that the important aspects of manufacture are labor conditions, environmental impact, and quality. Seems straightforward enough to not make people work so hard they jump out the window of the building. Even when recycling electronics (and burning up all the stuff you can't resell) people have to deal with pretty horrible conditions. Like Nate said, we live in a global economy, where capital can move to wherever it has created poverty so as increase the rate of exploitation and profits. On the other hand that also means that a genuine internationalist response to exploitation and pollution is possible. I'm glad Sparkfun is making a point of transcending national boundaries, AND the boundaries for labor still exist within every country! When you see an object, don't forget the people who made it, be it a sparkfun break out board (totally awesome reasonably paid people) or a transistor, or an iphone (suicidal workers in china forced from the countryside by dictatorial economic policy) It is all an incremental accumulation of many hours of labor that make up the lives of countless human beings. As sugar coated as everyone is trying to make it, China did become the world's largest manufacturer today & we are feeling the effects of no longer being a super power. We have to pay Russia $63 million to launch an astronaut. We can't afford super highways while watching other countries sit in traffic. We can't all live in houses with unlimited credit lines while other countries live in apartments. You could take the Apple approach: "Designed by Apple in California - Assembled in China." Or the Bahco approach: "Made in Spain - Quality of Sweden"
Hey- random question here but do you spark fun genii have a tutorial on how to etch a PCB? Or at least do toner transfer? ive been having some problems with my boards, and you guys are usually spot on at describing everything in detail. If you dont its ok, just a random thought. its called send your order through Batch PCB, which is easier in my case. (parents don't like the sound [smell?] of those chemicals) and you wont have PTH soldermask, silk etc.. If you want something cheap and fast, nothing beats etching your own boards. Depending on your skill level, you might even wind up with near professional results. (My biggest problem has always been drilling all the holes.) Making your own boards is a good skill to have. everyone should at least try it. Forget the sharpie and have a look at photo etching boards. Drill holes using a Dremel drill press at high speed using carbide bits. Steel bits don't last for many holes before getting dull in fiberglass. You must use a drill press with carbide bits, as they are very brittle, and break easily. If you print your artwork, with holes shown in the pads, then a small dot will be etched away in the middle of the pad which makes centering the drill easy. Etch boards in a sealable plastic container to help with smells. If you etch your own boards, you'll find the SMD parts are much easier than through-hole. You'll also find that pre-treated boards are better than self-treated. Check out MG Chemicals for chemicals for this. They even have a dry resist film now which can be applied using a laminator, which would have made my job much easier long ago if it had existed then. Alas, there was no internet back then, so finding things was much harder. Digi-Key has photosensitive PCBs. Make sure you get the matching developer. These could require positive or negative artwork, so you'll need to print the artwork to match (but usually positive now I think). These boards have an emulsion on them that reacts to light, much like film. After developing, you will have a positive image of the traces of the PCB, which resists the chemical attack of the etchant. They still need to be etched just like any other board. The advantage, is that you can produce much finer lines, and usually there are very few pinholes in the traces. When I was much younger, around 24 years ago, I made many boards using this process. I had the photosensitive resist in liquid form, and I applied it to the board. This prevented wasting board, if something went wrong in the process. I could strip the board, and reapply the resist. The key is to drill at high speed with a sharp bit. Steel bits only last for 20-30 holes before getting too dull. You can tell by how the copper lifts around the edge of the hole, after it's been drilled, which can also remove the pad if it is small. Carbide bits when drilled at around 20krpm+ don't have this problem, and can drill hundreds of holes. If drilling by hand, they will usually they break before they get dull, as all it takes is one slip, and the bit is broken. You can buy resharpened carbide bits from a number of places, for around $0.50 each, so it is worthwhile to use them. With regards to electronics, if you do a final assembly somewhere, its the country of origin... simple. That would be why Apple devices say..
Don't forget the COO of the PCB and even the solder. This is needed when our customers or distributors try to import our products into their perspective countries. You mean respective countries, not perspective. I read somewhere about organic LEDs. When will Sparkfun get these? I get sad seeing open pit mines, thinking "That's where my Arduino comes from." Then, maybe there can be electronic components sourced from local fisheries! Organic LEDs are typically used in displays rather than sold separately. Search Sparkfun for "OLED" and you'll find a few. Don't confuse the use of the word "organic" with something that's "environmentally friendly". Fish is still only good for eating and slapping. Thank you for sharing this. I have been hearing a lot lately how we should only buy American made items, how we should boycott imports, when one, that becomes close to impossible with items containing more than three parts, and two, it shows incredible narrow-mindedness to think that with 196 countries in the world, (I'm already counting South Sudan), Americans have cornered the market in the making of everything. The politically motivated "Us versus the world" mentality really needs to be curtailed. At least until the next Olympic Games :-). Why would the US want to treat every country in the world the way it treats Cuba, Somalia, Libya, North Korea? Or put another way, why would the US want to put itself into the penalty box on trade? I would think all countries around the globe would have to deal with this at some point or another, some more than others perhaps. That pair of jeans you're wearing might say 'Made in Mexico' but did that denim also get made there? No, it probably was imported too. When you buy a Chevy or Ford, what do they say? Made in USA ... but you look at almost all the parts on it and you are bound to find other countries listed. It's a fuzzy line to walk, and I would much prefer 'Made in ___' as opposed to a COO. "We can now claim that SparkFun USA is the country of origin"
So Sparkfun is now a country? Cool! Should it be "Made in Earth"? Do you have an underground lair/factory? :) How about "Made on Earth"? It reminds me of Molson Canadian beer ads saying "Made from Canada". True, true. It's funny how one can be in a country, but to be in the earth usually means you're pushin' up daises. :) I like the symmetry of your argument "Made in ____ "
It's the result of a quirk in the English language which doesn't translate to science an engineering. A nation is a place, so something is produced in place; regardless of where in that place it was produced. The planet is an object, so something is produced on it, in it, over it, etc. Consider the phrases: "Produced in the United States" "Produced on United States Soil"; as I said quirks, both mean the same thing. Not quite for John McCain, he was produced on US Soil, but not in the United States. There are many places which are US Soil and not in the United States, and Visa Versa, as many airports have a section delineated as "International", and one's presence there does not imply being "in the United States". One born in the International Terminal might not for example qualify for natural citizenship. True. A device could be made in the US embassy in China and still technically be "Made in the US". Whether or not your components are imported, they're yours now, and the combination of devices that makes up a finished board was assembled here in the States. So you're exporting your own products, which you own, rather than acting as a port through which the country of origin routes its own items, and the simplest way to label them is as being American. I would simply label your items as "Made in USA -- for component origins visit sparkfun.com/importinfo". That's more than due disclosure, and helps your customers understand the global nature of electronics commerce. Remember that import tariffs often consider the re-importation of components differently; so Mexico will charge less for a product made in the US from parts sourced in Mexico. Customs however, wants that in the Declaration (legally binding), not some link on the Internet (Not Legally Binding). I think people's concern shows active care and concern about the manufacturing of their goods. Regardless of you political slant, its hard to ignore the power of wallet voting, and those who exercise it, even in the comments section (indirectly) are mostly being responsible citizens. If you are to ask us loyal, blog-reading customers to trust you on the international issues - then it is expected that you will act accordingly. This means that Sparkfun should be/remain vigilant in ensuring its supply chain is up to par with our expectations - you know, follow laws, be nice to workers, manufacture quality stuff, etc. put another way: I am much more open to a group hug when I am assured the collection of strangers is devoid of pickpockets. I have not seen any indication that Sparkfun is skirting this responsibility, and you guys are definitely one of the most down-to-earth and transparent companies around - but a post like this should address your end of the bargain. A group hug devoid of pickpockets is a fantastic way of putting it. I agree with you. As to including our end of the bargain in the discussion, I agree that we should as transparent as possible, but I'm not sure what bargain you're referring to? With the post I was trying to point out that we really do have a global economy. The bargain I am referring to is a bit of "trust us" mentality that is more evident in the last paragraph (which seems written to end customers as much as B2B and regulatory demands). Again, I find few companies more able to play the "trust us" card than Spark fun, I was merely pointing out the nature of that trust on both sides, its part of what makes SFE a great company and a great place to shop. Ah, yes, the components come from all over, but where is the real "value" added that makes these diverse components, useless by themselves, a desirable product? I contend that it's where the important design work takes place that defines a products "origin". I also think the "business is ahead of government" claim supported by SparkFun's RoHS compliance is a bit off the mark. Sure, you aren't being mandated by the US government, you're being mandated by the EU, so what's the difference? It's crazy to think that business would adopt something like RoHS all by themselves. It's more expensive, it's less reliable, and it's probably not going to reduce environmental lead concentrations by a measurable amount anyway. Companies all over the world were dragged kicking and screaming to that party, they surely didn't embrace it voluntarily, rather they had it forced down their throats! If RoHS is so great, why are a lot of "critical" industries (defense, medical, etc.) exempt? It's a bit like Obamacare, if it's not good for everyone, it's not good for anyone!! As a director of Engineering and Quality for a small USA based medical company I'll give you some background about RoHS for medical. The main reason for the medical exemption is because European companies are unusually strong in the field, Philips, Agfa and Siemens to name some of the big ones. For say an MRI machine, it might take 2 years to do a software validation, and many multi year development cycles, and in a lot of cases, a lot of work in each country for regulatory testing. So the European council felt it was better to exempt the medical industry, at least for now, so that they could handle the change in a normal development cycle, rather than a forced update to a lot of products. Since we all use parts which are mostly of the shelf, RoHS comes to the product over time, will little work on our part, our device has become nearly RoHS simply because part manufactures obsolete the non RoHS part over time and replace with RoHS parts. Because it's just that, critical. The issue that most have with RoHS is that the technology is unproven, and can be failure prone (for further research: XBox 360 red ring of death). Now, I don't know about you, but if I go to the hospital, I'd be a lot happier in knowing that the medical devices I'm hooked up to are going to function properly. RE: other exemptions: Speaking from experience, military gear is unreliable enough as it is. No need to increase failure rates. C&M hardware: I don't want the control and monitoring widgets in a nuke plant to be less than 100% reliable. The same for air traffic control, stop lights, and other important areas. The point of RoHS is to remove the hazardous heavy metals from products, so that recycling operations and disposal of your electronic devices doesn't let those same substances (cadmium, arsenic, lead &c. into the ground, air and water. There's quite a body of research on low-level exposures and health impact to people that suggests that limitations and entire removal are a very good idea for your health. And yes, eventually, RoHS will reduce environmental lead concentration. It's like cutting off the water shutoff valve at the main when you have a leak. there's still residual water in the pipes, so it's going to continue leaking until the water empties from the pipes. Eventually, all of those nice lead and cadmium using devices are not going to exist anymore, and the environmental lead measurements are going to stop increasing, which is the point. additionally, once RoHS as a technology is proven and matured, those very same critical industries are going to move to it as well. If you've been working with any of those mission critical categories, you'd know that they're at least a generation behind the bleeding edge in every way, because they know how the old gear works, they know how and when it fails and they don't get surprised by never-before-seen issues. TL;DR: RoHS is good for you (literally), soon there will be no exemptions, and to do nothing, because an environmental miracle won't happen overnight, is just wrong. well your wrong about that... RoHS is hardly unreliable these days. It's just that the people in control of manufacturing decisions are uneducated and scared of the change still. How many products do you own that have the WEEE symbol on there (the wheelie bin with the cross on it)? And what percentage of those products are faulty? Where the system is mission critical, the use of 'Fail Safe' PLC's with double, or triple backed up control hardware is the protection mechanism... You think the early nuclear plants don't get hardware failures? Very few. The point I was trying to make was not that RoHS is not the way to go (far from it) but that it only takes one high-profile issue to cause backlash from the public. This would be exacerbated by a critical application failure, especially in a health care or other mission-critical context. early nuclear plants don't get hardware failures? The point I was making is that the manufacturers of such items don't, and didn't, go with leading-edge technology because it needed to mature a little before making its way into those applications. The key problem is that they didn't know how it would age, how it would perform, how reliable it would be, etc. There are regulatory compliance issues and safety certifications in that sector that require knowledge that was, at the time, unavailable. Like I said: RoHS is good for the environment, good for the collective health of the public, and the exemptions aren't going to be there forever, since the body of research on RoHS failure modes is growing daily. You got the data to back that up? The fact that electronic equipment is so reliable is a testament to good design and testing more than the reliability of solder. I've spent the last 20 years of my technical career making test equipment to measure the reliability of electrical interconnects, such as solder joints, and I can tell you it's a huge concern for anyone that cares about reliability. Believe me that no one in the solder joint reliability community is saying "we've got this all figured out" about lead free solder. BTW, "control of manufacturing decisions" is only about 10% of the problem. And, yeah, I've got the data to back that up! You got the data to back that up? And, yeah, I've got the data to back that up! So, by your logic, no company would ever implement ISO or IEEE standards unless forced by some governmental agency? Why are critical (I don't know why you use quotation marks here. Apparently, you don't think medicine is very important.) industries are exempt? Well, yes, it is true that we should reduce the unnecessary amount of lead that we use in TVs and cellphones and gadgetry, but if RoHS were to be forced on medical companies, you can say good-bye to valuable imaging equipment like ultrasound, MRI, probably even CT, PET, and nearly all diagnostic imaging technologies. "Sorry, I can't check on the condition of your fetus. You see, we're trying to save the environment." You know what is RoHS compliant? Leeches! P.S. I'm not really sure why US is having such a difficult time implementing healthcare. We've had it down for quite some time now. By my logic, companies do, by and large, what is in the best interest of themselves. That is the nature of business. I doubt that anyone would be rushing to produce RoHS compliant anything without being forced. I'm not arguing that lead is a good thing at all. My issue is that the electronics industry is a comparatively small contributor to the world-wide problem of environmental lead contamination, and many in the industry feel that we were "picked off" simply because we were a (relatively) easy target. Everytime I hear that Canadians come to the US for Healthcare, I am reminded that Sarah Palin crossed into Canada for hers. which makes some useful comparisons between the two systems. The USA spends more per capita than any other country in the world (http://en.wikipedia.org/wiki/Health_care_in_Canada). The WHO ranked Canada at 30th, and USA at 37th for quality of care worldwide. The recent case you quote was for a small child that has no chance for recovery. The Canadian medical system did not want to spend further funds on a child that would not live. This sounds to me like a just decision, but I can understand the plight of the parents. The outcome regardless of whether the US stepped in or not, is that the child will die. So I don't see how the US helped in this case. Thank you for support. I don't want to turn the SparkFun News forum into a mudslinging debate over healthcare, but I do believe in the importance of intelligent discussion and debate. I do think that the case mentioned is one of the intervention of a religious group "Priests for Life" and not indicative of the decisions of the US medical system. I am positive that you would find similar decisions to similar circumstances by many US hospitals and doctors. Looks like the underscores do not always work in this format. Thanks for fixing the links. I couldn't figure out how to stop them from italicizing, and obviously the underscores had something to do with that. NP. The formatting help at the bottom of the text entry window shows how to add links. 1) Yes, that was a bold statement on my part, but I stand behind it. By "had it down" I didn't mean that we have mastered the art of healthcare, I mean that we have been implementing it. Our system is not perfect, it could use improvements in a number of areas, like anything else. But for the few people that unfortunately "fall between the cracks", so to speak, there are thousands of people receiving care. Your comment "...if it's not good for everyone, it's not good for anyone!!" suggests to me that you will never have a satisfactory form of healthcare. As they say "You can please some of the people all of the time, all of the people some of the time, but never all of the people all of the time." For now, I'll accept a system that can help the largest number of people in need. 2) "My issue is that the electronics industry is a comparatively small contributor to the world-wide problem of environmental lead contamination..." Is this really the case? I'm not being sarcastic, I genuinely would like to know which industries contribute more lead than the entire electronics industry. 3) Medicine and Ethics is a very delicate area. It is not a decision that I would want to have to make, but this issue is bigger than this forum here. I'm sure there is more here than is covered by FoxNews. "P.S. I'm not really sure why US is having such a difficult time implementing healthcare. We've had it down for quite some time now." Quite a bold statement considering Canadian healthcare costs $5,614 per person per year (2010), and the median wait time to see a physician is more than 4 weeks. I wouldn't say you "have it down". Lower costs and better outcomes; the median wait for poor people in the US to see a doctor is in months, not weeks, and usually in the ER, where costs are highest. I'm happy to know your doing your own manufacturing Nate. "Made in USA" means a lot more if you think about it. When you got everything together and started building it I know you followed the countries labor and environmental laws. Rules that I can live with and sleep soundly about. Can't say that about China or any other countries because their laws are different, not enforced, corruption or they don't have any. I've actually been reading about a lot of small companies doing their manufacturing in the USA because China doesn't have the quality and has problems meeting time requirements. We assemble electronics in Boulder because of the time requirements you mention. We don't build 1,000 of anything. Instead, we build 50, see how they sell, then build to demand. Our business is not about maximizing margin, it's more about always having the neatest/newest widget. We need the flexibility of manufacturing near by. I agree with you and the importance of labor and environmental laws. However I'd like to point out that governments are rarely as up to speed as business. For example, SparkFun is RoHS compliant not because of US law, but because we do business with Europe. Businesses often set their internal regulations higher than local laws in order to compete globally. Your right, businesses often will set standards so that they can compete globally. But what they are really doing is setting their standards so that they can compete globally. You have to be RoHS or your limiting your potential clients. But there are laws that the U.S. imposes on SparkFun that other countries can just skirt by. That was the point I was trying to make. Right, and the truth is, thanks to the power of global trade and the influence of the world's more powerful economies, even businesses in countries where the environmental and labor standards are more lax have tightened up in order to cash in. Everyone wins!